The Japan Bank for International Cooperation (JBIC, Governor: Tadashi Maeda) signed on April 1 a project finance*1 based buyer's credit (export finance) *2 agreement totaling up to USD900 million (JBIC portion) with Pengerang Refining Company Sdn. Bhd. (PRC) of Malaysia. The loan is co-financed with Mizuho Bank, Ltd. (also acts as the facility agent for the facility), Sumitomo Mitsui Banking Corporation, MUFG Bank, Ltd., and Citibank, N.A., Tokyo branch bringing the total financing amount to USD1,500 million. The co-financed portion is covered by insurance from Nippon Export and Investment Insurance (NEXI). In addition, this is an international co-financed project backed by a consortium of export-import banks and export credit agencies from various countries. The purpose of this project is to provide financing to PRC, which is indirectly invested in, via wholly owned subsidiaries, by Petroliam Nasional Berhad (PETRONAS), the state-owned petroleum company in Malaysia, and Saudi Arabian Oil Company (Saudi Aramco), the state-owned national oil company in Saudi Arabia. 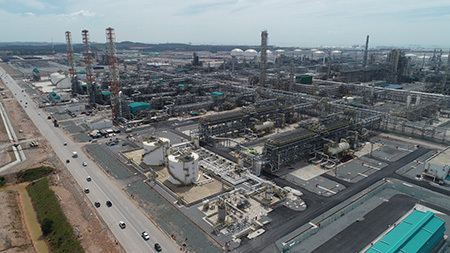 PRC plans to construct and operate an integrated complex, consisting of several petrochemical plants, in Pengerang, a municipality in the southeastern region of the state of Johor in Malaysia. This will be the largest complex of its type in Malaysia. The complex will house a refinery with a daily refining capacity of 300,000 barrels and also ethylene, propylene and other petrochemical plants (total annual output of 3.3 million tons). The loan will be used by PRC to purchase a steam cracker facility*3 from Toyo Engineering Corporation. In Malaysia, numerous capital investments are expected to be carried out in the oil refinery and petrochemical field. This project, in which JBIC supports Japanese companies with the export of products, contributes to sustaining and improving the international competitiveness of Japanese industries by creating business opportunities for Japanese companies in the field of petroleum refining and petrochemicals in Malaysia. This project is a national project for Malaysia and is expected to play a major role in implementing the 11th Malaysia Plan. The project is also of great strategic importance to Saudi Arabia Vision 2030 and Saudi Aramco's long term strategy increasing its global refining and petrochemicals footprint, including Asia. This project is in line with the economic and industrial policies of the governments of both countries. JBIC contributes to the structuring of project financing with its abundant experience and knowledge of project financing by participating in projects from early stages with ECAs. As Japan's policy-based financial institution, JBIC will continue to provide financial support for overseas business development and the export of plant, machinery and equipment by Japanese companies, by drawing on its various financial facilities and schemes for structuring projects, and by implementing its risk-taking function while also collaborating with foreign export credit agencies. Project finance is a financing scheme in which repayments for a loan are made (solely) from the cash flows generated by the project. Buyer's credit is a loan JBIC extends directly to a foreign importer (buyer) to finance the import of machinery and equipment or others from a Japanese company. A steam cracker complex is a facility to produce chemical compounds such as ethylene, from naphtha.